I’ve been mulling over Uncharted 4’s ending these past few days. Initially, I didn’t know what to think and though I’m still not entirely sure how to feel about some things, I’m coming to terms with it. SPOILER WARNING: Full spoilers for the end of Uncharted 4: A Thief’s End, and other games in the series. If you haven’t finished yet, and don’t wish to be spoiled, read no further! Don’t Scroll. Also expect spoilers in the comments. It’s Nathan Drake’s last adventure—one that’s stripped of the overly excessive use of explosions and set pieces as with previous installments, in favor of a more grounded narrative. Drake’s relationships are at the forefront in this latest game, and how his actions affect those who love him, and the lengths he goes to in order to justify his self-involved decisions. There are still firefights, crumbling cliffs under the weight of risky platforming, treasure hunting and thrill seeking to buffer the focus of an aging man, forced to face that his life is no longer solely his. There are considerations to be aware of—an uncomfortably settled life with his wife Elena. An old friend Drake has distanced himself from in Sully. And an older brother, Sam, in a world of trouble—and at a very different junction in life—who drags Nate back into the thick of chaos and perilous adventure, which Nate never really wanted to leave. Everything constructed in this fourth installment is a deception. It’s in the title “A Thief’s End”, within the character study of Drake’s motivations and lies, a story designed to raise the stakes, and the ultimate trick in the rug being pulled out from all of that, to deliver a happy ending. Nathan Drake gets a happy ending. No one dies. Compromises in the marriage lead Nathan and Elena to live a successful life—legally and blissfully. A final resting place for some thieves, just not ours. Thinking on it now, I’d say this deception of Uncharted 4 started from the very first entry. No matter how many times you could throw Nate off a cliff, or “die” in wave after wave of bullet barrages, Nathan Drake, the rogue treasure hunter, always skirted real, consequential danger. 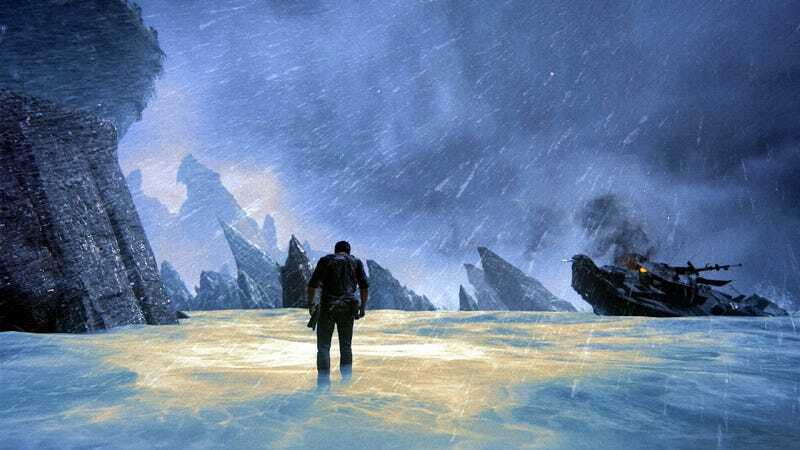 With each game, those hazards built over the years, culminating with a fake-out death in Uncharted 3: Drake’s Deception. With that, and headed into Uncharted 4 virtually on a media blackout, I carried the belief that the next time, maybe Drake wouldn’t be so lucky—couldn’t be so lucky—to not suffer the one loss which would balance his flirtatious dances with death. The one which would show him his selfishness, and his mortality. He’d pay with his life, or someone close to him would pay for it. The series kept building that risk as Drake continued taking those risks, and in the end, nothing physical was lost—everyone’s life was in tact. It’s not wholly true that Drake didn’t come close to losing everything. He almost lost his brother a second time. He almost lost his marriage, and that’s probably the close call he needed. This realization came equipped with Elena’s (mostly) level-head, and their steps towards healing over the course of a couple of chapters with much needed marriage counseling (the pressure of impending death, avoiding mercenaries, probably made them come to understandings with each other much faster than weeks sitting in an office under professional guidance). Nate had to learn to be truthful to Elena, and himself. Both admitted desires for adventure but eventually comprised to do so more cautiously. Under this new agreement, treasure hunting doesn’t have to be life threatening, and without sacrificing the thrills, via completely legal means to do so. With permits. “A Thief’s End” is an interpretation on words I wasn’t expecting, and prior to playing the game through, they also had me speculating. With all the action built up from three previous installments of bigger explosions and adventures, increasing risk and danger—the “end”, to me, meant death. Specifically it meant Drake’s death. In hindsight, maybe that’s too obvious a translation, particularly for a series whose slight of hand had previously lead to a situation of drug-fueled hallucinations realizing fears at their worst. They showed that slyness before. I think they continued it here too, with a vague title that could have gone either way. It’s what the series is about, for the most part. But sometimes, even the most direct, obvious answer can have just as much impact, and still maintain an element of surprise—as a gutsy move to actually follow through on the worst case scenario. In what feels like current media’s reliance on killing off major characters for shock value and to toy with emotions (though Game of Thrones and The Walking Dead have been doing this in their novels for years, the success of their respective television shows have cemented a new, mainstream norm), Uncharted 4’s bucking of that trend to give Nathan Drake and his family a happy ending felt somewhat daring. It’s refreshing, and interesting. And best of all, it’s surprising—pleasantly so. That’s the deception the series had laid out. Only to turn that on its head and translate the words “A Thief’s End” to a more muted, somewhat literal interpretation—no more stealing, no more a life of criminal activity, and an end to being lawless. Meeting a Maker, and friends. It didn’t happen this time. Despite what I was anticipating, I’m pleased that Nate, Elena and Sully got a fairy-tale ending—one with two additions to the Drake family. Nate and Sam also got closure on a less than ideal life, and are able to adapt accordingly. More so, Nate was able to come full circle to give his and Elena’s child a life different to the unstable one depicted in Nate’s and Sam’s childhood, and their stumbling upon their mother’s employer’s own shortcomings. That was an example of another way life can go when we latch onto obsessions, and make them a primary focus. It’s a life of loneliness, unfulfilled and one that’s all consuming—I mean, they did beat that over the head a little bit, but it’s an important lesson, all the same. Why wouldn’t I be pleased that some of my favourite characters in video game history get to live blissfully and peacefully? If anything, the weirdest thing was that I was in disbelief that I could be so wrong. This ending though, is much better than that alternative. Drake and Elena in Uncharted 4: A Thief’s End are written brilliantly, as individuals, and as a unit, for closer inspection of what is portrayed as a natural, evolving relationship rooted in realism in spite of implausible situational adventuring. I’m not one for love themes in most games but these two are a couple I root for. Sully, and even Sam, are characters I care about. Sam, maybe less so, but his death, I believe could be argued, may have been a moot point. One only to serve to bring Nate grief, and would not have been a plot point to necessarily solidify what Nate already knew, as he and Elena had mostly worked to untangle a heap of emotions which spoke to some of the specific problems of living dangerously and enjoying it. Maybe Sam’s death could have strengthened a resolve to give up a life of crime (and maybe the closing chapter may not have felt a tad rushed) but Elena’s compromise and admittance to missing the adventure allowed her and Nate to move in a direction without a weighted guilt hanging over them. Maybe with Sam’s death, they would not have even sought that future. I’m not quite sure. Uncharted 4: A Thief’s End may have pulled a fast one over me for the months leading up to the game, and even within some of its final moments. Ultimately, though, I’m glad it dashed my hopeless speculations, and expectations. What did you think of the ending, and the game overall? I expect full spoilers in the comments, once more, so spoiler warnings should apply and be used! Follow N. Ho Sang on Twitter at @Zarnyx if you’re feeling adventurous, or you can read her articles here.